Vermont Gov. Peter Shumlin rarely backs away from a fight, but he had to beat a hasty retreat Wednesday night when he found himself outnumbered by four black bears that were feasting on bird feeders in the backyard of his Montpelier home. "I had a tough night," Shumlin said in jest to Valley News editors and reporters at the start of an editorial board meeting yesterday. The 56-year-old Vermont native said he had returned to his house in the state capital around 10:30 p.m. and went to bed. The rental home, located in a suburban neighborhood about a 10-minute walk to the Statehouse, backs onto a field and woods. "I hear something banging on the porch, and I’ve just fallen asleep, and I look out at this tree… and there are four bears on my bird feeders," said Shumlin, who said they included a sow and two cubs. "I yell at them through the window, they run away, and come right back," Shumlin said. Barefoot and straight out of bed, the first-term Democrat said he was intent on rescuing his bird feeders. "First, I scare them away, and they keep coming back," Shumlin said of the bears. "So I go out and grab two of the feeders, run back into the house, then they come back, they knock the suet out, then knock the big feeder down, and they are going at it," said Shumlin, who also showed a short video he made of the encounter on his smart phone. Shumlin said he went outside again, and found a bear more aggressive than he expected. "The (bear) charges me on the porch – I’m tearing through the door. You almost lost the governor," Shumlin joked. "Security was not there. I was within three feet of getting ‘arrrh.’ "
Shumlin, who grew up in a rural part of Windham County, said he had put up the bird feeders to remind him of home. "I’m not a city boy, so my only connection to nature now is to feed the birds like mad. It makes me feel like I’m back in Putney," he said. But his hobby also runs counter to recommendations from the Vermont Fish and Wildlife Department, which last month urged homeowners to take down their bird feeders to prevent bears emerging from their winter dens from seeking out the high-energy seeds. 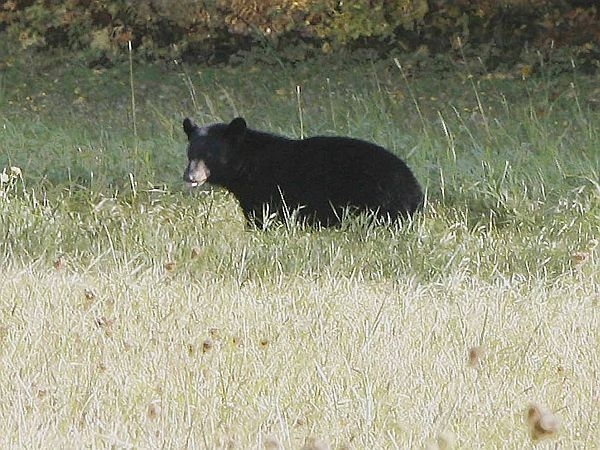 The department estimates that almost 6,000 black bears are now found in Vermont. Fish and Wildlife spokesman John Hall, a 45-year department veteran, said suet and black oil sunflower seeds are "particularly attractive to bears" who can "can pick up the scent of either of those foods from quite a long distance. "A lot of us feed birds as long as we can because we enjoy seeing them, and thinking that we are helping them," Hall said. "At this time of year, birds can readily find food, and they don’t need our help." Bears, on the other hand, Hall noted, can become habituated to bird seed, pet food or trash that is left outside. "We don’t want to tempt bears to seek food near people. That can be their downfall," Hall said. And those bears could visit again, even if Shumlin has stored the feeders inside. "Unfortunately, sows, mothers, will teach their cubs that same behavior," Hall said. "They are a very smart animal. Once they learn a particular spot, they are going to register that for the future."